Why train on a stationary bike at the gym that doesn't fit you? Why train on a stationary bike alone, at home? Why pay thousands for a trainer, training software, and time consuming setup at your home? Come to FF Hickory CompuTrainer Studio for structured training programs. Train with your friends, in a safe environment, away from harsh traffic and weather! Upload and track your results to your favorite apps (Strava, Training Peaks, etc.) automatically after each ride. What is CompuTrainer Indoor Cycling? A CompuTrainer is an indoor bike trainer with a precision ergometer measuring power wattage and cadence. It’s what professional and avid triathletes and cyclists use to train hard and increase their fitness while riding indoors on their own bike. CompuTrainer is best in its class by a wide margin. It sets the industry standard for accuracy (± 2.5%), power (1500 watts max), quality, and service lifetime (10+ years). Cycling and triathlon coaches worldwide use CompuTrainer as their primary testing and training instrument. 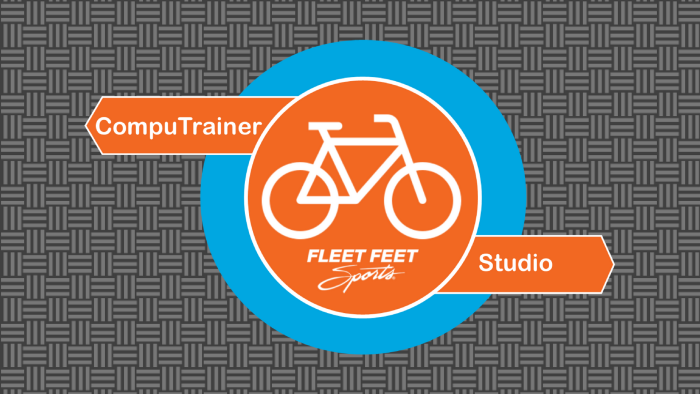 In our CompuTrainer Studio, you’ll bring in your own bike (road or triathlon bikes only) and first test your cycling fitness in a group setting with up to 6 athletes to determine your “functional threshold power” (FTP). 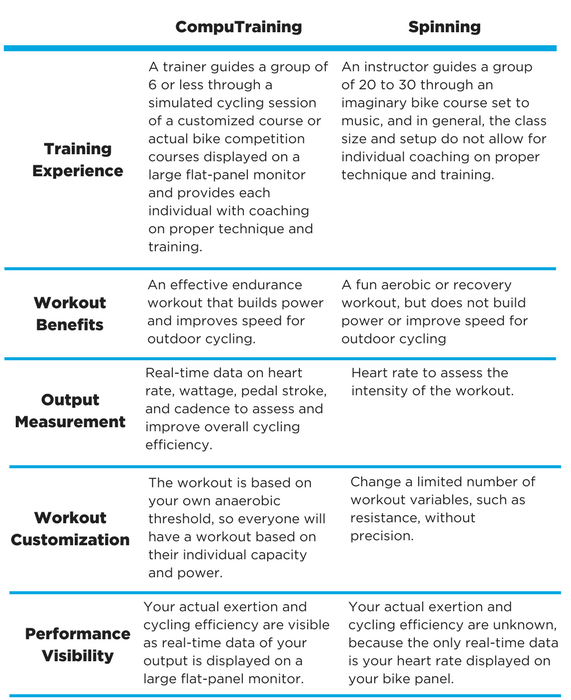 Each workout thereafter you’ll get custom-tailored intensity workouts and virtual rides that will quickly improve your cycling fitness, endurance, and explosive power as you burn up to 1,000 calories per hour! You can also experience simulated bike routes of any bike course in the world, including famous triathlon and Iron-distance events, or challenging climbs of the Tour De France. 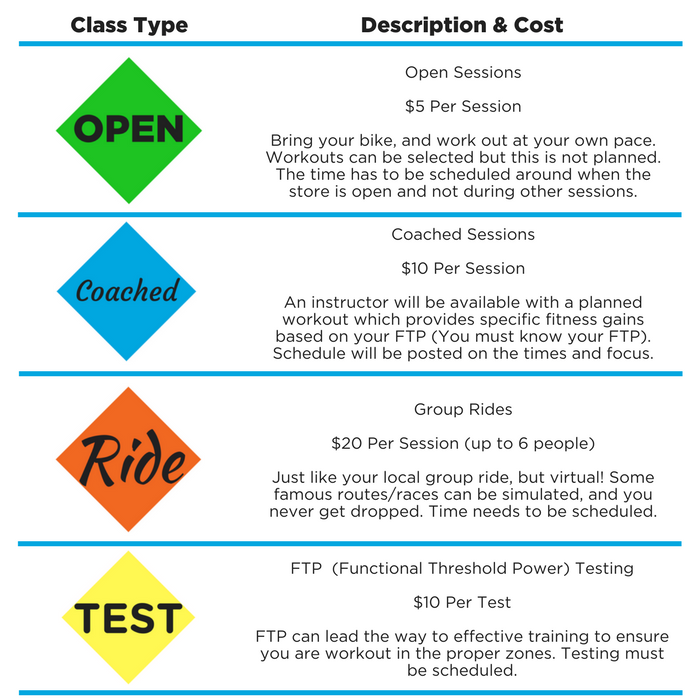 These training programs are a “must do” for anyone working towards a century bike ride, triathlon, or looking to improve their overall aerobic fitness while enjoying a fun group setting! Call Fleet Feet Hickory at 828-304-4786 to purchase a session or package and to reserve your spot. Reservations are first-come-first-served – so sign up early. Be sure to arrive 10-15 minutes early for a class to secure your reserved spot. Reservations can be made up to 7 days in advance, and up to an hour before start time. You can cancel your session by calling 828-304-4786 up to 1 hour before the session starts. If you don’t cancel in advance, you will be charged for the session. WHAT COURSES DO WE RIDE? Most of the weekly rides are 60-minute Interval and Strength building workouts. Longer course rides take place on the weekend and at other designated times. We change the workouts each week. We use workouts designed by RacerMate and PerfPro Studio as well as Sufferfest videos. Your road bike, with training skewer for the rear wheel. You will need a trainer tire to protect our trainers from road debris and grime. We have them available at special pricing for CompuTraining athletes. Hydration and nutrition (make sure that you have eaten something 30-45 minutes before riding as this is a high intensity workout). Don’t forget your cycling shoes! Wear bike shorts, a workout shirt, bike socks and cycling shoes. The first 15 minutes are used to set up, warm-up and calibrate. You set up your bike on the trainer (we will help you), pedal for 5-10 minutes and then calibrate to adjust the starting pressure on your back tire. Workouts start with this warm-up and will end with a cool-down, all as part of the workout. WHEN CAN I TAKE THE FTP TEST? FTP testing will be conducted by appointment only. CAN I PARTICIPATE WITHOUT TAKING THE FTP TEST? Short answer yes, but it's strongly recommended that you take the FTP Test. The CompuTrainer and training software adjusts for each rider's individual ability based on FTP. Without an accurate FTP number, you're just guessing. WHAT'S THE DIFFERENCE BETWEEN COMPUTRAINING AND SPINNING? With the shorter days and inclement weather of winter already here, devoted cyclists may be wondering if it’s time to hang up their bikes and look for a good indoor cycling workout to get them through the off-season. Two of the most well-known are CompuTrainer training (or what we like to call CompuTraining) and spinning. While both seem similar and offer the kind of camaraderie that comes with exercising with a group of like-minded folk, CompuTraining and spinning are different in some very fundamental ways.